The Halpern Financial team typically has a monthly meeting to update each other on key initiatives and get input from all team members on various projects. It’s one way we make sure everyone is on the same page and working together to bring a consistent high quality of service to Halpern Financial clients. But for the December monthly meeting, the first item of business was…cookies. 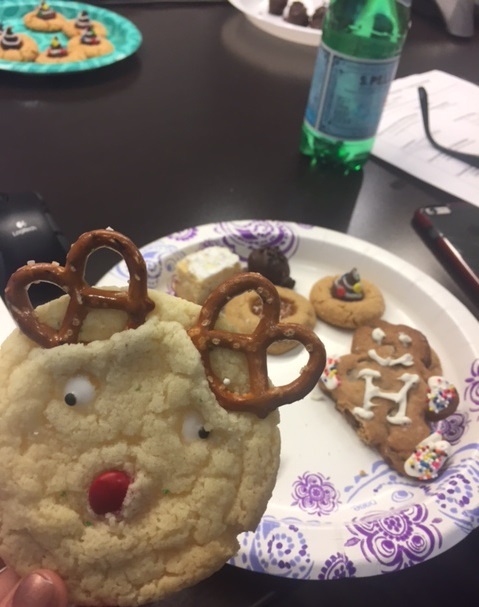 In typical Halpern Financial style, our first-ever cookie exchange had an organized plan and we created a process to ensure an objective taste test. Until the scores were counted, the baker of each cookie was anonymous…although the Halpern Man was kind of a dead giveaway! When we got to sampling the cookies, it was ON. Who would be the Cookie Queen or King? It was a challenge for each of us to pick a favorite for Best Taste and Best Presentation. The competition was fierce, but in a room of champion bakers, only one cookie would win in each category. What can I say? It was the sugar talking. Once I tallied the scores, I called out, “Cookie #4 for best taste!” Immediately, our Portfolio Manager Kirsty Peev leaped up, whooping with joy, and did an exuberant chocolate-truffle-fueled victory dance. Yes, I had to depose Kirsty as the Cookie Queen, and Jennifer Davis and her delicious Almond Raspberry Thumbprint cookies took the throne for Best Tasting Cookie. The crown for Best Presentation went to Lindsie James. Her peanut butter cookies were adorned with “Christmas trees” made of Hershey Kisses, complete with sprinkle ornaments, stars on top and sparkly glaze “garland”! And then, hyper on sugar, we all continued our monthly meeting with a LOT of energy. From all of us at Halpern Financial, we wish you a joyful holiday season and New Year. If you would like to attempt any of our cookie creations we have included the recipes below!